In Asia, Japan -0.59%. Hong Kong closed. China closed. India +0.06%. In Europe, at midday, London -0.07%. Paris -0.54%. Frankfurt -0.97%. Futures at 5:45, Dow -0.45%. S&P -0.49%. Nasdaq -0.56%. Crude -0.48% to $53.75. Gold -0.28% to $1,310.70. Bitcoin +0.4% to $3,457. Today is Cycle Day 2 (CD2)…The expected decline on CD1 was delayed and has occurred during overnight trade fulfilling 2714 Average Decline Projected Target. Price is now below CD1 Low (2722.25), so this level will be bulls recovery objective by end of this cycle. Scenario 1: IF price holds bid above 2714, THEN initial upside objective targets 2722.25 – 2724.25 CD1 Low and 3 Day Central Pivot Zone. Scenario 2: IF price holds offer below 2714, THEN initial downside objective targets 2704 – 2696.50 Low Range Extension Zone. Today is Cycle Day 2 (CD2)… The expected decline on CD1 was delayed and has occurred during overnight trade fulfilling 6979.50 Average Decline Projected Target. 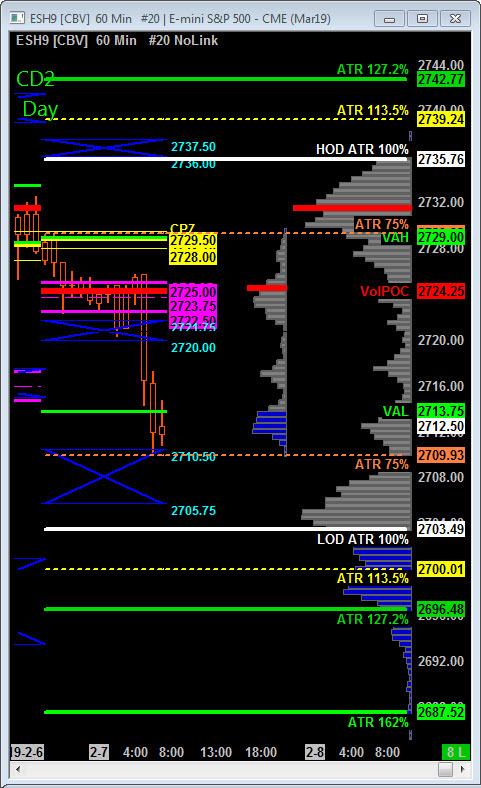 Price is now below CD1 Low (6972.25), so this level will be bulls recovery objective by end of this cycle. Scenario 1: IF price holds bid above 6960, THEN initial upside objective targets 6969 – 6978 3 Day Central Pivot Zone. Scenario 2: IF price holds offer below 6960, THEN initial downside objective targets 6943.25 – 6938.50 CD2 Violation Low Range Zone.